In 1998 I found myself at the T.G.I. Friday's in Austin, Texas. I was being put up by my employer at the time while considering a relocation opportunity there. For the week I stayed at the hotel I would head down to the bar while waiting for my dinner. Each night I ordered a Guinness, and eventually my dinner would come and I'd finish the stout, grab my food and up to my room I would go. 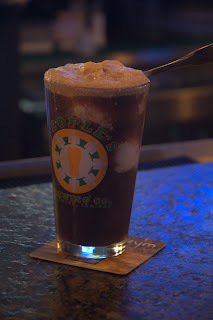 On the third night, the bartender asked me if I had ever tried a Guinness Float. That night, back in March of 98 was the first time I'd had the magical combination of a dry Irish stout and wonderful Blue Bell's Vanilla Ice Cream. Since that night, I've been trying different combinations of ice cream and stouts in search of a more perfect shake or float. In those years I've come to appreciate the stout float as much as the shake; in fact one of the benefits of the float is that one often gets a sidecar of stout in addition to the float proper to make a complete and legal pint. Shakes, on the other hand are/have been.. shaky at best in this department. Recently I was at 10-01 in Broad Ripple and while perusing the menu I happened to notice that they had the following: Brown Butter Maple Caramel Ice Cream - house made and as I would find out, absolutely delicious. This ice cream sounded amazing and was even more so than the name hinted at. The stout on hand that night was Rail Jumper from People's Brewing in Lafayette (BOILER UP!). The stout by itself is a wonderful chocolate stout and deserves its own post. The real magic though is in the combination. The chocolateness of the stout AND the dryness pair perfectly with the amazing ice cream. This is, without a doubt, the quantum leap in stout/float/shakes that I've experienced in a long long time. At 10-01, you can order the "stout float" and one day *cough* The Good-Knight (tm) and get this awesome combination yourself. Sure, you can buy a Founder's Breakfast Stout and mix it with a good Bryer's Vanilla Bean ice cream at home and have an awesome dessert but THIS combo is truly an amazing mixture. Right now, it's the dessert on my "last meal" list.. if I had one... ahem.. Anyway I recommend it to anyone who likes this rare (or is it?) treat. For the stout or ice cream fan it is well worth the experience. At a minimum, it's a good reminder that beer can be a wonderful ingredient and not simply a beverage. This is one combination capable of challenging anyone's notion other wise. Oh, and if you disagree.. I'll be happy to finish yours.